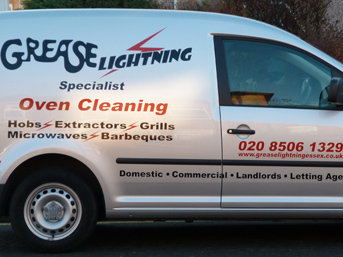 Grease Lightning is a specialist oven cleaning company based in Woodford servicing East London, parts of Essex and the surrounding areas. Our specialist, van-mounted cleaning system ensures all traces of grease, grime and burnt on carbon are removed, restoring your oven to near show-room condition! Witness a transformation of your oven! Click the image to enlarge and see the results that can be achieved by our experienced technicians.